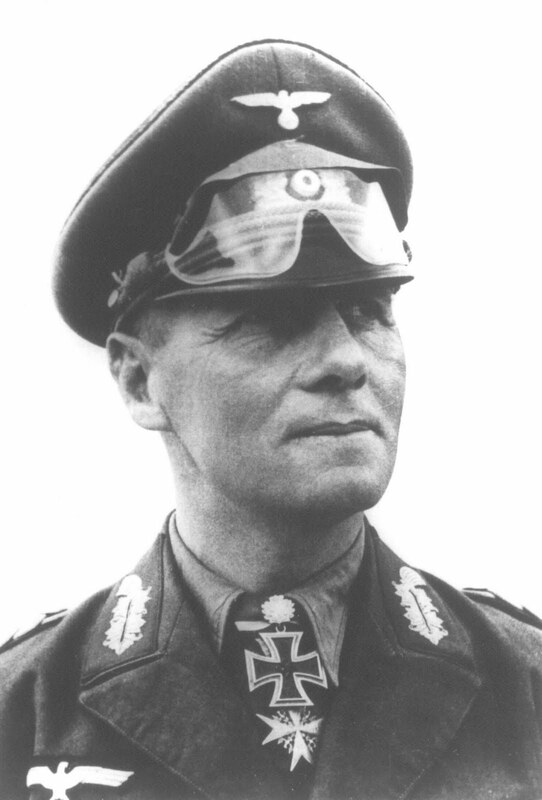 Historical Figures: Erwin Rommel’s Story – Expanding your culture, one touch at a time. The charismatic leader of Germany’s Afrika Korps from 1941-43, Rommel led his outnumbered, under-supplied troops to numerous victories against the British in North Africa during the Second World War. Although his units were eventually forced out of the continent by a two-fronted Anglo-American assault starting in October/November, 1942 (The Battle of El-Alamein and Operation Torch, respectively) Rommel had solidified his reputation as a brilliant general in the 20 months prior as he led his armies in rapid advances from their bases in Western Libya into Egypt. Rommel’s use of quick, multi-pronged panzer maneuvers (a panzer is what cultured people and/or Germans call a tank) gained him impressive victories against numerically-superior British forces at Benghazi, Halfaya Pass and Gazala among others. Many historians believe that had Hitler invested more in the Afrika Korps and given Rommel the fuel his Panzers needed (those Nazis didn’t care much about their carbon footprint) the Germans could have pushed the British out of Egypt, crossed the Suez Canal, and secured the oil fields of the Middle East, inevitably altering the course of the war. Rommel’s reputation is still today that of a chivalrous officer, a cultured man and a reluctant Nazi. He coined the term Kriege Ohne Hasse (War Without Hate) to describe the fighting in North Africa and his treatment of Allied POWs (Prisoners of War) gained him praise from top Allied commanders. He tore up Hitler’s orders to execute captured Allied Commandos, Jewish soldiers, and North African civilians even though he could have been relieved of command for doing so. In one instance he even ripped off the dog tags of a Jewish-American POW before handing him over to the military police, most likely saving the guy’s life (this was before the US War Department realized that printing JEW on the dog tags of a GI and then sending him to fight the Nazis was a bit shortsighted). When the Australian garrison at Tobruk surrendered after a 240-day siege Rommel addressed the Aussies in perfect English, praising them and saying, “Gentlemen, you have fought like lions and been led by donkeys.” The act which truly solidified his reputation with the Allies was his decision to participate in the July 20, 1944 (failed) plot to kill Hitler. For his role in the plot Rommel was forced to commit suicide in order to save his family from prosecution, and his grave in Germany is still visited today by Germans, Brits and Americans alike. I recently asked Pulitzer-prize winning historian Rick Atkinson what he thought of Rommel and he said: “he was a good self-promoter, but he was still a Nazi, and we shouldn’t forget that.” It’s very true that for all of the praise he has received, Rommel was far from a reluctant soldier of Hitler’s Reich. His house in Württemberg had been confiscated from a Jewish family that eventually perished in Bergen-Belsen concentration camp. His letters to his wife Lucia show that even late in his life he was still captivated by Hitler’s personality. Although he never joined the Nazi party (which he felt was too “brash”) he did comment in 1934 that Hitler showed promise in dealing with Germany’s “Jewish problem.” His decision to help assassinate Hitler was motivated more by a fear that Der Führer was leading Germany towards a destructive defeat than by humanitarian reasons. And while Rommel never participated in the holocaust or other war crimes, given his position in the Wermacht he would have likely seen evidence of Nazi extermination policies, and yet he was never known to have protested. I recommend that you make a more careful research on the subject. He was a frontline soldier who was given the house as a gift from the government. It was not like he had all the time to investigate what happened before and after it was given to him or something. Most historians agree that he only found out about concentration camps and all in late 1943 or 1944, and at the very worst, “before being confronted with evidences, he didn’t want to know”. There is proof that he asked Hitler to install a Jew in a high office in 1943 to clear the misunderstanding. He had deep affection for Hitler, that was true, but it was not like they talked about the Holocaust all the time or something. The letters Rommel left gave the impression that at the beginning between them it was all about egalitarianism and an utopia for Germany. Humans are complex creatures. Long lasting personal affection for Hitler, although unfortunate, didn’t equal being a Nazi. No matter how horrible Hitler was, the man had given him the chance to live his ideals, which revolved a lot around loyalty and dedication – those words meant something in the days of old to soldiers. He also commented to General Eberbach (who was spied on by the British) that Hitler and his clan had to go. Using historian Maurice Remy’s words, it was even more remarkable that in the end, despite political naivety and inexperience and the special relationship with Hitler, he still found the strength to act against him. He, like other Field Marshals, knew that there was the chance assassinating Hitler would make everything worse that what it already was – collapse on all fronts and civil war. I agree that Rommel had a degree o racism, but it was nowhere near the uncommon level (in all Western societies those days) and it was not anything unlike modern people who complain about immigrants today – that they see problems with minorities doesn’t mean they support genocide. He did protest the bad treatment of the Jews and other groups of people, and protected and defended the Jews in Africa. That was why after the war, when they moved to Israel, and Manfred Rommel visited the country, they and other Israelis came to praise the Father and make the Son Honorary Guardian of Jerusalem. Same with black people. He was taught that they were inferior. But once he got in touch with them in reality, he gave them the equal treatment. South African white officers asked him for a separate prison cells, he replied that all soldiers were equal to him, and if they allowed the blacks to fight together with them wearing the same uniforms, they should stay in the same place.